A new study from Kyoto and Oxford universities and Indianapolis Zoo has shown chimpanzees spontaneously taking turns to complete a number sequencing task. Previous studies have shown chimps working together in strictly alternating turn-taking scenarios. However, these results are the first to demonstrate that chimpanzees can cope with more complex permutations of turn-taking, with no external cues to help time their behaviour. The research, published in the journal Scientific Reports, gives important insights into the evolution of turn-taking, which underlies a range of social interactions, including communication and language. Dr Dora Biro, co-author of the study from Oxford's Department of Zoology, said: "Coordinating behaviour is an essential component of many social situations and can enable groups of individuals jointly to solve problems. In communication, coordination often takes the form of turn-taking, where one individual takes cues from the other to decide on the timing of their own input. This can allow for the efficient exchange of information. "Many animals, from insects through birds to primates, take turns during certain types of communication – as do we humans during conversational exchanges. But taking repeated, coordinated turns to achieve a common goal is much less well studied outside the communication domain, despite the possibility that all such behaviours draw on the same underlying cognitive skills for turn-taking. "Our research examined the abilities of our closest evolutionary relatives, chimpanzees, to coordinate their behaviour while completing a computerised puzzle in stages. We showed that extended bouts of turn-taking emerged spontaneously in the subjects, enabling them to solve the complex coordination problem effectively." The chimpanzees were already experts at touching a series of numbers in the right order but had never been given a shared version of the task. In this exercise, the numbers 1 to 8 were split between two screens, with pairs of chimpanzees required to take turns to ensure the numbers were picked in the right order. For example, one touchscreen may have shown 1, 5, 7 and 8; the other 2, 3, 4 and 6. The chimpanzees were rewarded with small pieces of apple on successfully completing the task. Of the six chimpanzees in the study – three mother-and-offspring pairs – all achieved high levels of accuracy from the outset. The young chimpanzees made fewer errors and were quicker to respond than their mothers – however, during control tests involving each chimpanzee working individually with a computer program, the mothers were faster, suggesting that young chimpanzees are better at paying attention to their mothers than vice versa. Dr Biro added: "The finding that young chimpanzees more readily took cues from their mothers when looking to take their turns reveals interesting parallels with other aspects of information transmission in chimpanzee societies. For example, during the learning of tool use by wild chimpanzees, we also see young individuals paying attention to older ones much more than the reverse. This kind of asymmetry has important implications for the direction of information flow – for example, how quickly new innovations in behaviour will spread through a group. "Besides turn-taking, our task may also provide insights into abilities for cognitive perspective-taking – in other words, the capacity to improve coordination by mentally putting yourself in someone else's place. Brain studies have shown that this is a skill that musicians use while performing duets that require them to take turns. Whether our chimpanzee subjects made use of such perspective-taking capacities during solving the numerical turn-taking task is an interesting open question for future research." To conduct the study, the team developed a new 'shared' touchscreen apparatus that could be used simultaneously by two chimpanzees. Lead author Christopher Flynn Martin of Indianapolis Zoo said: "We think our apparatus has much potential to advance primate social cognitive research by enabling, for the first time, computerised touchscreen tasks that multiple apes must work on together to solve." 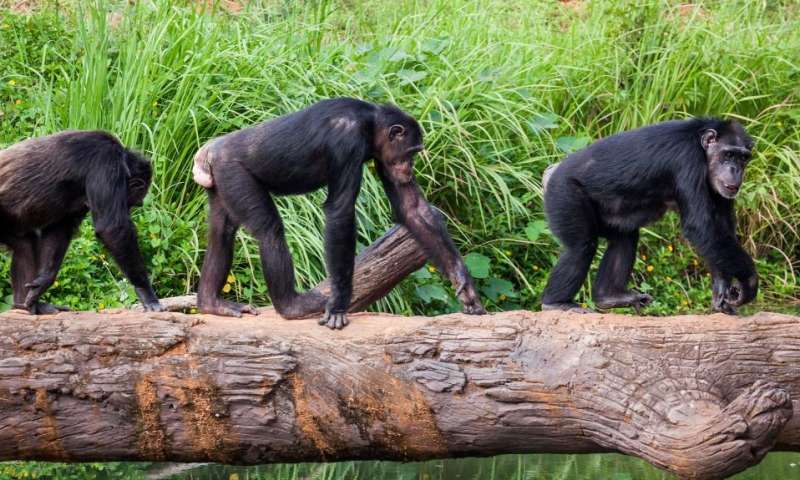 The researchers anticipate using the system for further studies on coordination, collaboration and competition within pairs of chimpanzees and other primates.